To write a book takes time, effort, more often than not, love. Happily, books are built to last, and with the proper stewardship remain relevant, provide insight and information, or entertain for generations. So why is it that, when the internet provides more avenues than ever for making work accessible, the vast majority of books written in the last 100 years are out of print and largely unavailable? Authors Alliance has been working with its members to help recover their unavailable books and give them another public life. 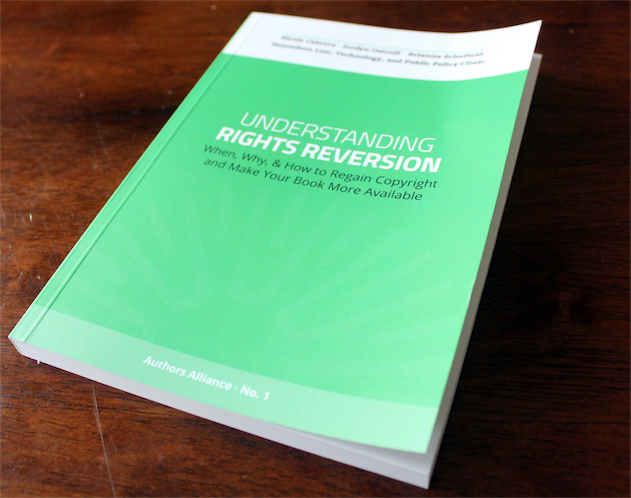 Since the release of our guide to Understanding Rights Reversion in 2015, we have provided information, assistance, and know-how to authors on the topic of recovering rights in order to bring back works that have fallen out of view. While many authors choose to make these recovered titles available commercially, a growing contingent has instead committed to ensuring their works endure in the public eye by making them available under Creative Commons licenses or dedicating them to the public domain. Many of our members’ titles are already discoverable through the HathiTrust digital library, and we are now partnering with the Internet Archive to make these works available in full on our new Authors Alliance Collection Page. Authors Alliance members Robert Darnton, Joseph Nye, and Thomas Leonard are just some of the authors whose books are now freely available in full-text digital versions under Creative Commons licenses. Join them to rescue your previously published work from obscurity, safeguard your intellectual legacy, and help us build a robust Internet Archive collection. If you have regained rights to your previously published book(s) and would like to feature them in the Internet Archive and on Open Library, this guide to sharing your work is a good place to start. If you have any trouble, contact us! We can help take care of the details and will even handle the scanning and ingest of pre-digital works. And, if you have a backlist but haven’t yet begun the process of regaining rights, we can help with that too. Check out our guide to Understanding Rights Reversion and our guide to crafting a reversion letter to get started. You can always reach out to us directly to help get you on track to unlock your books, regain your rights, and give your work new life online. Contact us to get started, and help us build the Authors Alliance collection page in the Internet Archive! We’ve written a DIY Guide to Sharing Your Book for Authors Alliance members over on Open Library. Very interesting concept, I have a few previously published books that I still retain rights to that I might think about submitting.